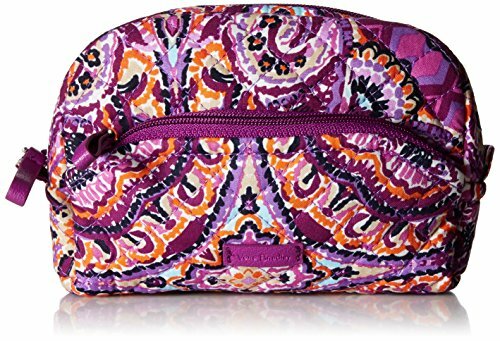 Vera Bradley has cleverly crafted a cosmetics case that adds a colorful touch to your vanity. The Iconic Mini Cosmetic case is the fashionable solution for storing your everyday beauty essentials – measuring 4.5 inches high, 6.5 inches wide, and 2.25 inches in diameter. The Iconic Mini Cosmetic case is perfect for keeping all your beauty essentials clean and organized. PVC lined interior cotton allows for easy cleaning even the messiest of situations. The spacious main compartment is perfectly sized for storing cosmetics and bottles. The smaller front exterior pocket stores brushes and smaller tools, keeping them separate and clean. Stylish and functional, this bag is a beauty lover’s dream. Add a pop of color to your vanity or travel the world either way, your beauty essentials are secure and organized. When quality material meets precise craftsmanship, you get a bag made to last through all of life’s journeys. Care: Spot clean *Bag only, brushes and beauty items not included.